How big are the owls? Why are female raptors bigger than the males? That seems backwards. Do the owls mate for life? When do the babies' eyes open? How long does the mom sit on the eggs? Does the dad sit on the eggs too? When do the owls sleep? How old are the babies when they leave the nest? Why do the babies have “fur” instead of feathers? Why do the babies leave the nest before they can fly? That seems really dangerous. Do the babies return to the nest after fledging? How can you tell what kind of bug was delivered? 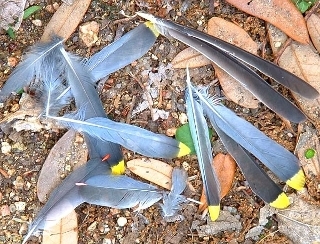 What happens to the trash (feathers, etc.) in the owl box? How can you tell which owl is trilling? 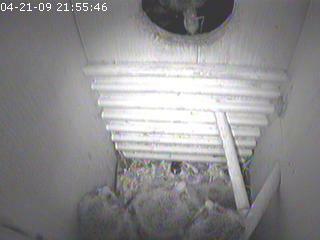 Why don't you position the camera to reach the back of the owl box? Don't the owls hate having the light on all the time, even at night? Are your plans for building the owl box available? Why do you use a black and white camera, rather than color? Can you please provide more details about the Magic Fingers Squirrel Control Device? Trust evolution (aka Mother Nature) to fine-tune all these details. Gehlbach speculates that it's an advantage for females to be large, because (1) a larger female can lay larger eggs, and hatch larger chicks, (2) she has more reserves of body mass to help her survive times when food is scarce or temperatures are cold, (3) she is the main defender of the nest when it contains eggs or chicks, and larger size helps her fight better (in the case of screech owls, the foes would be starlings or squirrels). The short answer is that owls work the night shift, so they have to get most of their rest during the daytime. If we are watching the live camera, we can often see and identify the food item as it arrives in the entrance of the box. Unfortunately, this is difficult if you are viewing online, because the food “handoffs” are very quick (quicker than the rate at which images are uploaded). Sometimes we can tell from sounds on the microphone in the box--katydids and june bugs sound crunchy. We have also noticed that when the owls eat a moth inside the nest box, the air quickly fills with specks which look like tiny snowflakes: these are actually the scales which moths and butterflies have on their wings! 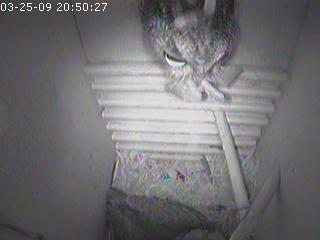 The female removes most feathers and other large debris from the owl box. Bones, feathers, and insect legs which are swallowed by the owls are mashed up and compacted in the owl’s gizzard, and later regurgitated. We sometimes find these “owl pellets” and dissect them to see what we can identify. Inside the nest box, there is always a population of tiny beetles and ants which live in the nesting material and probably clean up some of the leftovers. “Acrobat ants” are a common species (the name comes from the fact that they sometimes look like they are doing a handstand), and we have read that they don’t bother the baby owls. However, they might attack other animals which try to get into the box, so overall the ants may be beneficial to the owls, even if they do consume some food scraps. Fred Gehlbach also discovered that some of the most successful owl nests had small snakes living in the nesting material. These snakes (Texas blind snakes) resemble earthworms. In the nest box, the blind snakes presumably eat insects which might otherwise parasitize the baby owls. However, the owls did not “install” these helpful cleaners on purpose: instead the snakes arrived as potential meals which were just fumbled during the handoff. *Gehlbach, F. R. 1994. The Eastern Screech Owl: Life history, ecology, and behavior in the suburbs and countryside. Texas A and M University Press, College Station.